In the interest of being slightly less boring, I am summing up on projects and posting when they are totally done, even though they may span several days. So, finishing a panel on an afghan that has multiple panels may be a project for one day, but I am not necessarily posting those here each time, because it can be too repetitive. Instead, I’ll keep track of the days I work on it and post a big one when I am done. Or, I’ll post some of them when it is new, then wait until I am done to post the other days. Whatever I feel like on any given day, basically. I came home from work last Tuesday determined to work on the blanket I am making for the high school Parents’ Club auction, but I got sidetracked. You see, it is really cold here. Really, really cold. And I can’t find the hat I crocheted for myself last year. The yarn is Red Heart With Love in Ocean Blue, which is listed as a worsted weight, medium, 4, but it seems a bit bulkier. I am surprised at how much variation there is with a weight classification for yarns, but it nice to have some variety for various purposes. This is a fairly warm scoodie with the half double crochet stitches giving it some thickness, but if it is a very windy day, a hood on top of it would be helpful. I used a K hook, so the stitches are kind of loose and the wind gets in there. 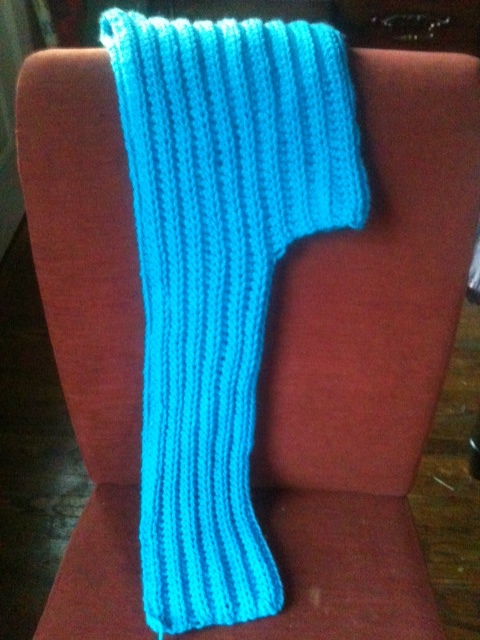 I may eventually make another one of these with a smaller hook and more rows. Overall, though, I am very happy with this one! I’ve been told it makes my eyes look bright blue, which is nice, too. My favorite part of this, though, is how I had a need and I made something myself to fill that need. There are many things I love about crocheting, but making useful things is definitely high on the list. I feel so much less a consumer and more a producer. I am starting to understand how people start out just making a nice baby blanket and end up raising sheep to shear and make their own yarn–not that I think I will get that far, but I can definitely see the appeal of making more and more of your own materials. This is also why I like having a stash of yarn available–I frequently go into my stash to make things. I like being able to make something to fill a need I have without having to wait until I can get to a store. I prefer to be inspired by what I have on hand as much as possible–not that I never go to the store with a project in mind to buy supplies for, but that I like to have the option of being more spontaneous. For that matter, this applies to any art or craft supplies. I like to go buy things that appeal to me, then figure out how to put them together later. I think that working within limits inspires the greatest creativity in me. If I have too many choices, I get very overwhelmed. Working with what I have on hand forces me to view everything a little differently, making things work that I might not have considered. Do you buy art supplies and yarn with a specific project in mind? Or do you like to have a wide variety on hand for whenever the mood strikes?